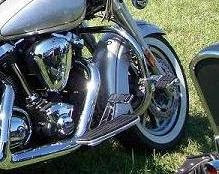 Engine Guards provide protection against cosmetic damage to your cruiser. Our genuine Yamaha engine guards are easy to install and come with instructions. Fits V Star 1100 1999-2009. Big Bar Engine Guards The big 1-1/4" tubing engine guards in the picture above match the V Star's big bike personality. These bars offer engine protection in the case of a tip over. The big bar engine guards also make a good platform for adding foot pegs for rider comfort. And last but certainly not least they add chrome for great looks. Engine Guards These triple-chrome-plated finish basic engine guards are a little less out there, but add chrome to make a great looking bike.